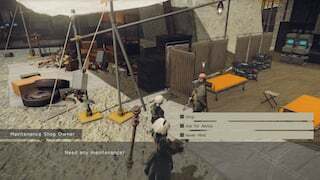 Maintenance Shop is a special Shop in Nier: Automata. Located in The Bunker, and in the Resistance Camp the shop allows players to purchase special upgrade abilities and increase item storage, among others. 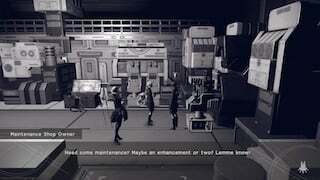 Shops are handled by NPCs called "Maintenance Shop Owner". I dunno if it&apos;s a glitch but the Scanner in the Bunker vanished from my playthrough. It was right after the Goliaths attached the city. After that he never showed up again, even after reloading the game. It should be added that fusing chips with different capacities result in chips with different capacities. Ex: Fusing two Ranged Defense with capacities 11 result in a Ranged Defense+1 with capacity 12 and fusing one with capacity 11 and other with 9 result in one Ranged Defense+1 with capacity 11. I don&apos;t know the math behind it nor the minimum capacity that can be achived but I hope that this will be useful. It also should be added that fusing chips with different capacities result in upgraded chips with different capacities. Ex: Fusing two Ranged Defense chips with 11 of capacity result in a Ranged Defense+1 chips with capacity 12 and fusing two Ranged Defense, one with capacity 9 and other with 11 result in one Ranged Defense+1 with capacity 11. I don&apos;t know the math behind it or how far it can be the variances of capacitys in maxed out chips but I hope that this can be useful.